Yesterday the mortal remains of this eminent engineer, distinguished not more for his professional skill than for his unassuming disposition and benevolence as a man, and for the part he played for upwards of a quarter of a century in connection with gigantic public works, were interred in Westminster Abbey, in the presence of some thousands of people. The ceremony, indeed, partook more of the character of a public than a private funeral. The honour of sepulture in one of our great national edifices, reserved chiefly for distinguished warriors and statesmen, was gracefully conceded In this instance by the Dean and Chapter, on application being made to them, to the body of one who was neither warrior nor statesman, but who was not the less, if, indeed, not the more, a public benefactor in his generation. After all, however, the Abbey may be said to have been, as it were, his parish church, for during that part of his career which was more immediately identified with the public weal he actually lived and laboured under its very shadow. It would be almost impossible to overrate the extent of the homage paid yesterday to the funeral obsequies of Mr. Stephenson, The feeling was not confined to the profession of which he was so great an ornament, but gathered around his tomb men holding high office in the public service, and members of the Senate and the bar. An application was made to the Duke of Cambridge, in his capacity of Ranger of Hyde Park, to permit the funeral procession to pass through the park on Its way to Westminster Abbey. Before acceding to the request, his Royal Highness deemed it expedient to ascertain Her Majesty’s pleasure on an application for which no precedent existed. 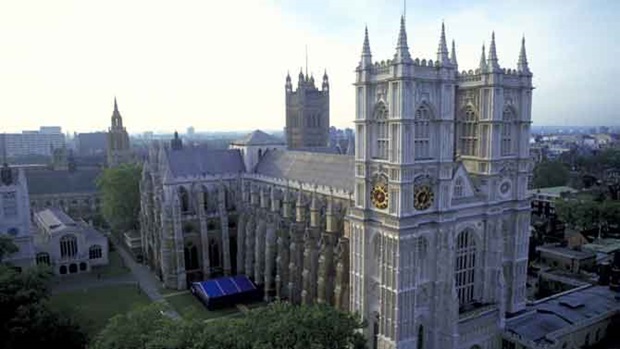 The answer of the Queen was to the effect that, considering Mr. Stephenson was to be buried in Westminster Abbey in acknowledgment of the high position he occupied and the world-wide reputation he had won for himself as an engineer, his funeral, though strictly speaking private, as being conducted by his friends, partook of the character of a public ceremony; and being anxious, more- over, to show that she fully shared with the public in lamenting the loss which the country had sustained by his death, she could not hesitate for a moment in giving her sanction to the course which his Royal Highness the Ranger had recommended. Side by side with this graceful expression of feeling on the part of the highest personage in the realm, and as exemplifying the regret which the demise of this eminent man has occasioned among all classes of the community, may be cited the application made yesterday to the authorities by a working man on the South-Eastern Railway, for permission to attend the funeral, who based his request on the fact that many years ago he drove the first locomotive engine called ” The Harvey Coombe, “ that ran from London to Birmingham, Robert Stephenson standing at his elbow all the way. The funeral cortège took its departure from the residence of the deceased in Gloucester-square about half-past 10 o’clock. It consisted of a hearse, containing the body, drawn by six horses, and 14 mourning coaches, each drawn by four horses, occupied for the most part by the immediate relatives and friends of the deceased gentleman. The first of two carriages which immediately preceded tho hearse, was occupied by the Mayor of Newcastle-upon-Tyne the Sheriff, Town-clerk, and Mr. Alderman Dodds. The Mayor wore his crimson robe and gold badge of office, and was accompanied, moreover, with the municipal Insignia. 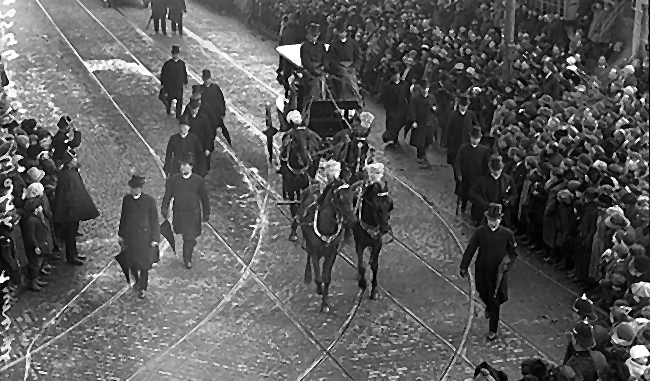 In the second carriage preceding the hearse were the Mayor of Sunderland and Mr. J. Ellis, Mr. John Dixon, and Mr. J. Pease. Mr. George Robert Stephenson, Mr. C. Parker, Mr. G. P. Bidder, and Mr. Robert Stephenson, as chief mourners, occupied the first carriage. Immediately following the hearse. In the two next were the Marquis of Chandos, Mr. G. C. Glyn, M.P., Sir Roderick Murchison, Mr. Joseph Looke, M.P., Mr. S. Beall, and Mir. J. Chapman. Following in others were Mr. Nicholas Wood, Mr. P. H. Stanton, Mr. William Kell, Mr. T. E. Harrison, Sir Joshua Walmsley, Dr. Bird, Mr. John Perry, Alderman Alison, of Sunderland, Mr. Joseph Sandars, Mr. George Vaughan, Mr. William Weallens, Mr. W. H. Budden, Mr. G. Berkley, Mr. J. Berkley, Mr. T. L. Gooch, Mr. W. H. Phipps, Mr. E. Clark, Rev. A. S. Gordon, Mr. R. S. Illingworth, Mr. R. Hayes, Mr. B. P. Stockman, Mr. J. Green, Mr. G. W. Schmidt, Mr. T. Carton, and Mr. Spiers. Leaving Gloucester-square the procession entered Hyde Park by the Victoria-gate in the Bayswater-road, passed along by the side of the Serpentine, into Piccadilly by the Apsley House gate, and proceeded thence by Grovesnor Place and Victoria Street to the Abbey, the whole route being lined by spectators, a large concourse of whom were collected in the open space fronting the west door of the Abbey and the entrance to Dean’s-yard. Meanwhile, some 3,000 or 4,000 persons had assembled within the precincts of the Abbey, all of whom were admitted by ticket. On arriving at Dean’s-yard the cortège was joined by the Council and principal officers of tho Institution of Civil Engineers, of which the deceased had been President – including, among the past presidents, Mr. James Walker, Mr. Joshua Field, Sir John Ronnie, and Mr. James Simpson; among the vice-presidents, Mr. John Hawkshaw and Mr. John R. M’Clean; among the members, Sir William G. Armstrong, Mr. John E. Errington, Mr. John Fowler, Mr. Charles H. Gregory, Mr. Thomas Hawksley, and Mr. J. Scott Russell; Mr. J. Allen Ransome, an associate; Mr W. Pole and Mr. Henry Maudslay, auditors; Mr. Charles Manby, secretary; and Mr. James Forrest, asslstant-secretary. 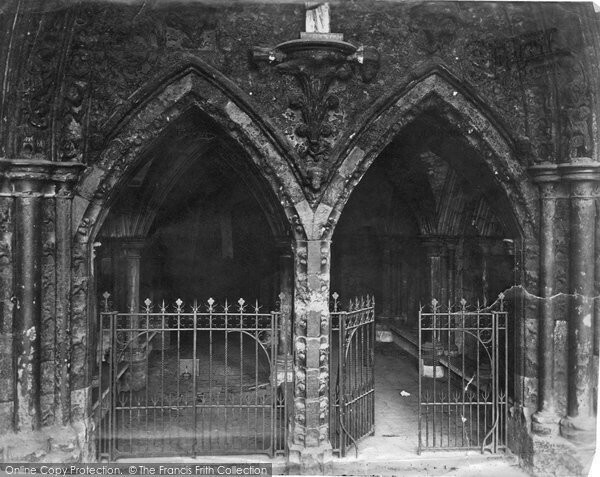 The coffin was taken from the hearse, and the procession reformed on reaching the Cloisters. There the very Rev. the Dean, Dr. Trench, the Rev. John Jennings, the Rev. Edward Repton, and the Rev. Dr. Cureton, three of the Canons of Westminster; the Rev. J. C. Haden, Precentor, the Rev. C. M. Arnold and the Rev. Mr. Jones, two of the minor canons, attended by the choir, met the body. Entering the Abbey by a side door from the cloisters the procession turned to the left along the aisle, and then traversed the whole length of the nave. The beadsmen and vergers headed the pageant, then came the choir; after them the dignitaries of the cathedral followed; then the coffin, borne by eight men, and then the great mass of the mourners and followers. The pall was borne by the Marquis of Chandos, Mr. G. C. Glyn, M.P., Mr. Joseph Locke, M.P., Sir Roderick Murchison, Mr. Samuel Beale, and Mr. John Chapman. As the procession advanced slowly up the nave the choir, accompanied by the organ, chanted the sentences from the office for the burial of the dead, “I am the resurrection and the life,” ” I know that my Redeemer liveth,” and ” We brought nothing into this world ;” from the music of Dr. Croft. Entering the choir, a few minutes were occupied by the mourners and friends in taking the seats assigned to them, and then the service proceeded. The Psalm beginning, ” I said I will take heed to my ways “ was sung by the choir to the burial chant of Dr. Purcell. Then followed the lesson, taken from the 15th chapter of the 1st Epistle to the Corinthians, commencing “Now is Christ risen from the dead,” which was read in an impressive manner by the Rev. Canon Jennings. After the Lesson the choir sang an anthem, commencing, ” When the ear heard me,” taken from the 29th chapter of Job. Leaving the choir, the procession passed towards the grave situated in the middle of the nave. Around or in the immediate vicinity of this centre of attraction, stood many public men who had taken no part in the funeral procession. 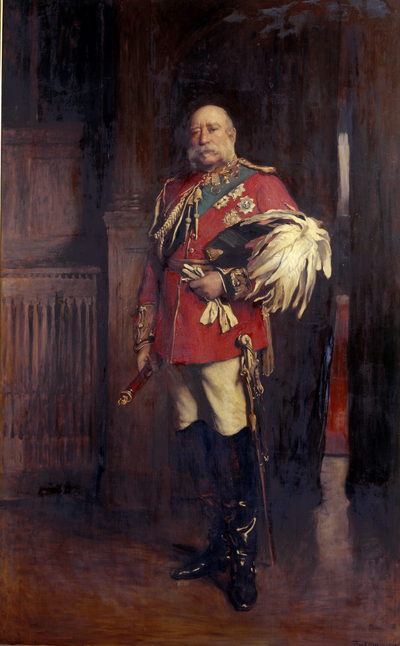 Among these were Sir John Lawrence, Sir George Bonham, Sir John Burgoyne, Sir Harry Jones, Colonel J. W. Gordon, Colonel Lysons, Sir Proby Cautley, Sir F. Smith, M.P., Sir Peter Fairbairn, the Hon. R. Grimston, Mr. Selwyn, M.P., Mr. Tito, M.P., Mr. Ayrton, M.P., Mr. Bovill, M.P., Mr. Cobbold, M.P., Mr. Ingram, M.P.,Mr. Arthur Mills, M.P. ; Professors Baden Powell, Stokes, Sharpey, Eaton Hodgkinson, Donaldson. Owen, and Wheatstone: Mr. C. W. Dilke, Mr. Mark Lemon, Mr. Serjeant Shee, Mr. David Waddington, Sir Cusack Roney, Mr. J. Bramley Moore, the Master of Dulwich College, and many others. Arrived at the grave, the choir sang the portion of the service beginning, ” Man that is born of a woman,” continuing, “In the midst of life we are in death,” from the music of Croft; -and concluding, “Thou knowest, Lord, the secrets of our hearts,” from that of Purcell. The Very Rev. 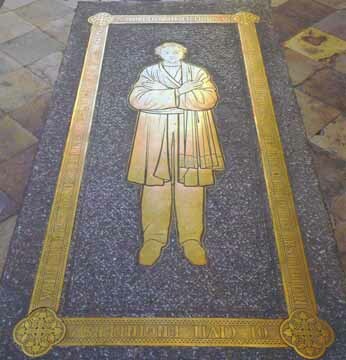 the Dean then read – at times under the influence of strong emotion – the passage, ” Forasmuch as it hath pleased Almighty God ;” and at its conclusion, and while the body was being consigned to the grave, the choir chanted, in a manner marvellously touching and Impressive, “I heard a voice from heaven,” to the funeral anthem of Dr. Croft. The ceremony concluded with the benediction, which was pronounced by the Dean. Mr. Turle, the organist of the Abbey, was at his post on the occasion. Much of the music was the same as he played at the funeral of Lord Nelson. The remains of Mr. Stephenson are placed in immediate contiguity to those of Telford, the celebrated engineer of his day, and that more by chance than design. Men of kindred genius, and engaged in kindred enterprises, they lie at last side by side. Stephenson was wont to say that, had Telford been buried in some quiet country churchyard, he should have wished hIs remains to be interred along with him there; but since he lay In Westminster Abbey that was an idle wish. It is gratifying to be able to state that Mr. Stephenson has bequeathed by his will a sum amounting to £25,000 to various public institutions, located chiefly in Newcastle- upon-Tyne, in the vicinity of which he was born, and with which so great a portion of his life was so closely identified. To the Newcastle Infirmary he has given £ 10,000; to the Literary and Philosophical InstitutIon of that town, £ 7,000; to the Institution of Mining Engineers there, £ 2,000; to the Institution of Civil Engineers, London, £ 2,000; to the Society for Promoting Christian Knowledge, £ 2,000, and to the Society for Providing Additional Curates In Populous Places, £ 2,000. At Sunderland, Shields, and Whitby all the places of business were closed in the afternoon. The ships carried their flags half -mast high, while muffled peals rang from the churches. At Newcastle and Gateshead the same marks of respect were paid; and in the former town a special service was held at half-past 11, and was attended by 1,000 workmen, who, dressed in black, walked in procession four abreast from the different factories. The church was crowded, and a funeral sermon was preached by the vicar.